The 21st Century Cures Act provides the impetus for home care and, soon, home health agencies to adopt Electronic Visit Verification (EVV). Beyond complying with legislation, most providers recognize that EVV and other elements of digital transformation are necessary for business. The technology market offers no shortage of solutions that could meet the new requirements -- but for agencies with more progressive strategies, the Cures Act is a timely backdrop to think more broadly, and seize an opportunity to differentiate service. 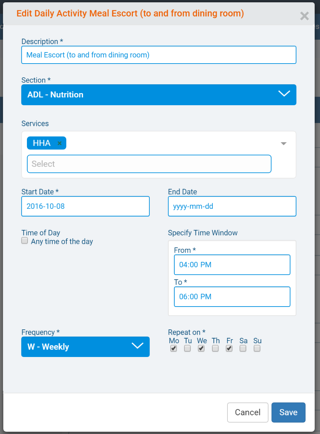 When undertaking the effort to implement EVV, it may be worth evaluating the scheduling software that populates the visit, the care plan that prescribes interventions, and ADL tracking. It is also wise to consider mobile: why are tablets and cellphones revolutionizing the agency’s ability to deliver care? In other words, take the time to pause, reflect, and think beyond the January 1st, 2019 deadline for EVV. Upstream in the process, agencies diligently match caregivers to clients as efficiently as possible. A clinical supervisor gathers all relevant clinical, personal and referral data to serve as the foundation of a comprehensive individualized care plan. A first visit is scheduled and the aides/personal support workers are trained on how best to deliver the ADLs prescribed in that care plan. A schedule recurrence is built, the care team assigned, and the QA team reviews time sheets, flow sheets, progress notes and ADL task sheets to ensure compliance, authorization limits and other payer rules. In such a workflow, there are multiple moving parts that require significant time and scrutiny – but there are clear and available means to improve efficiency and save time. 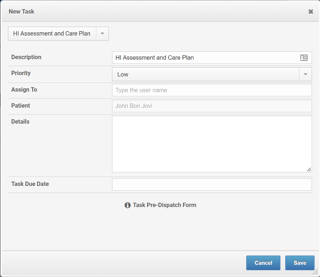 Mobility, software and business rules can meet EVV requirements -- and at the same time the care plans are digitized while the team develops an exception-driven quality assurance process for ADL task management. Those clear and available means to improve efficiency and save time exist within a full software platform that incorporates EVV. To illustrate the benefits of a choosing such a program, it helps to begin by describing the pain: the challenges both obvious and those that may not have been previously considered. Home care continues to be labor intensive largely because several stakeholders remain loyal to the paper world. The problem is that when ink meets paper, that information begins its existence as an isolated island. Its physical presence cannot be connected to any database other than a filing cabinet. 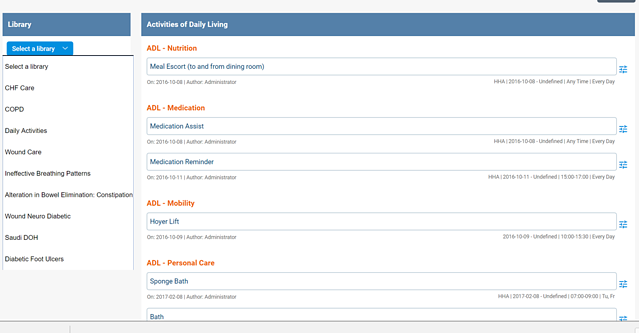 Authorizations, care plans, narrative notes, schedules, and time/task/flow sheets all move between departments, members of the care team and referral sources at glacier pace. Key information that is of use in day-to-day operations becomes unavailable, lost in filing cabinets, a treasure trove of insights becoming disparate and inaccessible when one needs them most. Businesses across all industries easily slip into an environment where departments work in silos rather than together, efficiently. Agencies might consider if their coordination, scheduling, care plan, charting, time and attendance, billing, payroll and reporting work in tandem, or if there are gaps causing communication to falter. For home care, operating in silos is directly linked to extra work, manual workarounds, and a heaping dose of unnecessary phone calls, voicemails, and emails. When there is a client referral, an agency’s intake coordinators need to establish certain guardrails to ensure that visits are not overscheduled. The initiation of care, re-assessments and task management all require considerable arrangement and a system of reminders. These are challenges unto themselves, and are compounded when coordinators and schedulers are off on vacation or sick leave, and replacement staff must step in and interpret nuanced work flow. The same clearly goes in the case of a coordinator leaving, and a new hire stepping in. From the perspective of field staff, that team member’s training must inform them which tasks and ADLs (out of a laundry list of items) are performed when and where. Agencies perennially complain that their systems cannot incorporate date, time, location and staff skills and abilities when dictate tasks. Failing to comply to care plans, authorizations and clinical standards can carry serious consequences. Digitizing any process without applying business rules and logic doesn’t solve the real problems. The pain point here is lack of digital strategy. Providers must leverage structured data where free form entry is limited. 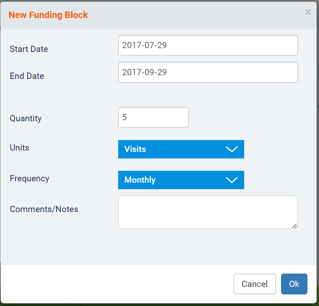 Fields should use drop down options, radio buttons and should be marked as required. Making sure that quality assurance is in place happens at the point of origin, and from there, will improve processes downstream. What’s more is that software can protect against rejected billing for rules regarding supervisory visits and training. So, with the pain points flagged, let’s turn to the benefits of a system that blends EVV into a broader mobile and digital approach. Consider first the joy and delight of agency staff when the client workflow moves across departments digitally and seamlessly. Coordinators can make the right decisions on case management, add authorization guardrails and follow a workflow path that was designed in concert with the referral partners. Clinical supervisors perform assessments that drive development of the care plan. 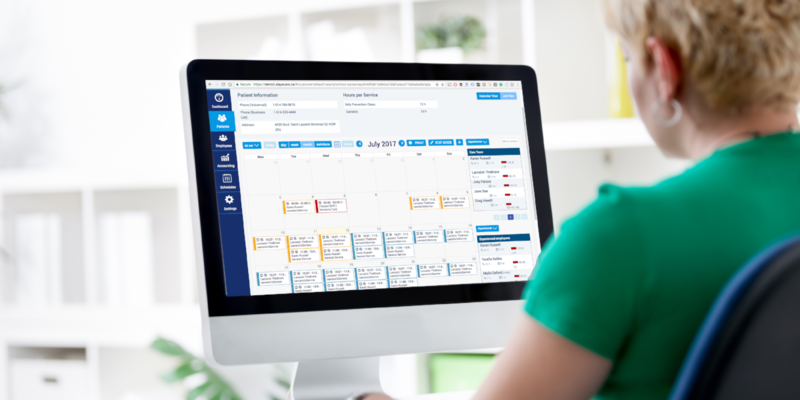 Schedulers pick up the ball and construct schedules that pull from the care plan and populate tasks, flow sheets and clinical documents. Aides and personal care workers access pertinent information from a home care app and check through or comment on individual care plan items. With all fields required, it eliminates any need for post-visit QA. Billing and clinical supervisors are exceptions to the rules and are free to focus their efforts on better coaching and clinical care. 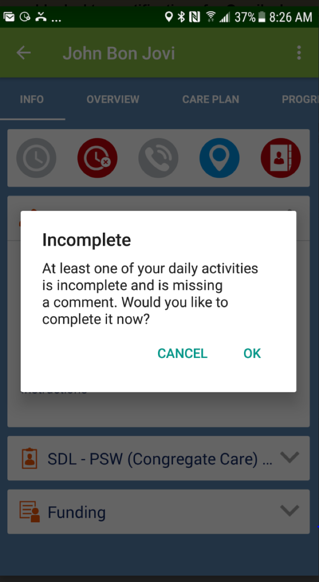 ADLs and service reports flow through to mobility as services, daily activities and task management. Required fields ensures high quality assurance. Reconciliation by billing and finance is a management-by-exception rule. At AlayaCare, we recognize that implementing new software is arduous and time-consuming. EVV is a must, and we firmly believe that agencies should consider thinking beyond its requirements and honestly evaluate an operation’s sustainability. EVV is just a timely launching pad to greater efficiency. More on these considerations can be found throughout our blog.